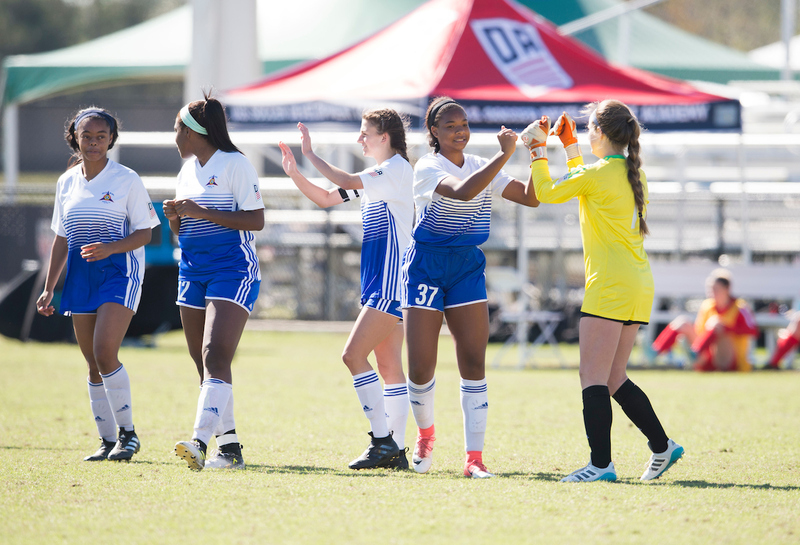 LAKEWOOD RANCH, Fla. (Dec. 10, 2017) - In the final day of the 2017 U.S. Soccer Girls' Development Academy Winter Showcase, Solar Soccer Club U-16/17 side kicked off the day with a 3-0 shutout against the Washington Spirit Academy - Virginia at Premier Sports Campus. Solar Soccer Club dominated much of the game, finding its three goals in the first half. In the seventh minute, Raigen Powell received a chipped pass and did well to half-volley it, sending the ball upwards towards the goal. The ball hung up a bit and then went in under the crossbar, with the wind helping it past the line inside the net for Solar's first goal of the game. In the 13th minute, Caroline Berutti fired a powerful and perfectly placed shot from distance, which once again hit the bottom of the crossbar before going into the back of the net. Berutti would add her second goal of the game on the 39th minute after converting a penalty kick with a high shot to the right side. With today's victory, Solar Soccer Club will finish up its Winter Showcase slate undefeated after also winning against Concorde Fire, 4-0 in its first game and beating Beach Futbol Club on Dec. 9 by a 2-1 score. Powell scored five goals in the three games combined to up her season total to 12.